It seems that many people still consider veganism to be some strange, far out diet that only hippies and health nuts prescribe to (not that there is anything wrong with either of these groups in my opinion). If some people believe that vegans are so radical, I wonder what they would think of raw foodists! Raw foodists love their fruits and veggies! Lately, I’ve been doing a lot of research on the raw food lifestyle and have decided that I am going to try to incorporate more raw food into my diet. 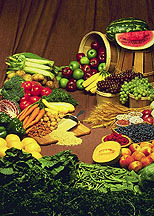 Raw food refers to any food that has not been cooked above 118 degrees Fahrenheit. Once food has been cooked at temperatures higher than this, chemical changes occur that form acidic toxins, mutagens and free-radicals. Live enzymes that aid in digestion are also destroyed when food is cooked. The benefits of raw food appear endless; increased energy, alertness, health and beauty! Matthew Kenney and Sarma Melngailis, authors of Raw Food: 100 Recipes to Get the Glow, state that, “It’s easy to spot a raw foodist in a crowd of people living on the Standard American Diet (SAD…an appropriate acronym). Just look for the unusually clear skin, glossy hair, and shinning eyes.” If raw foodists look that good, you can count me in. There are hundreds of delicious recipes online (some require a dehydrator), including Italian Chocolate Almond Zuccotto cake and Ruby Red Sushi. Even if you have no interest in becoming a full-fledged raw foodist, it still might be fun to experiment with your cooking and baking!